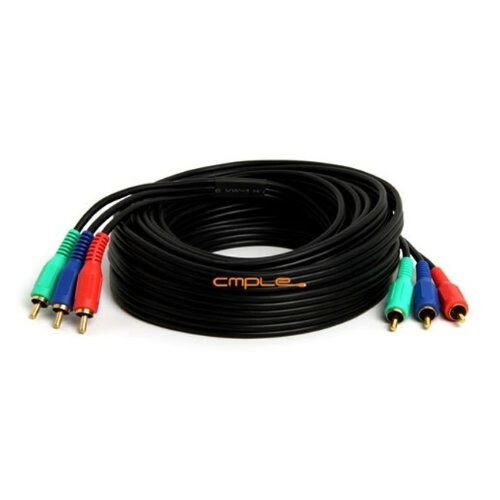 12ft Component Video Cable 3-RCA HDTV Gold Eliminate the spaghetti behind your entertainment center! No need to hook-up separate RCA video/audio cables. 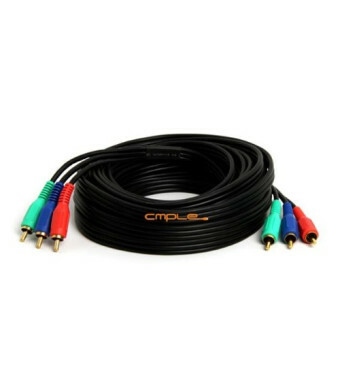 With this 3 RCA high graded professional cables will give you the best conductivity signal and quality. You will extract the most from your equipment and eliminate the unsightly mess of wires. For use with video cameras, DVD, VCRs, DSS, High Definition digital TV (HDTV), VCR, DSS, DVD, TV and so on. Color Coded: Green, Red and Blue Triple heavy-duty super shielded RG-59/U cables to maximum signal transfer and minimize interference. Gold plated RCA plugs to improve conductivity. Color coded and labelled for the luminance (Y) and chrominance (Pr, Pb) Signals. AV Cable Type: Component Audio/Video Cable Connector: RCA (Male) to RCA (Male) Length: 12 ft Color: Black Fully molded construction. Excellent quality.